Opening in the Fall of 2020, our Santa Rita Ranch campus will serve students in early childhood and elementary school. We are excited to be a part of this new community located in the Santa Rita Ranch development of northwest Austin, Texas. Our campus will be a brand new educational facility, but it comes with a rich tradition of academic excellence. Divine Savior Academy is part of one of the largest private school systems in the United States, one that has been educating students for over 165 years. We are excited to bring our history of college-prep academics, supportive teachers, and a loving Christian environment to our newest campus. Divine Savior is a community of families, students, educators, and friends. Our students learn and grow with the support of caring teachers, dedicated professionals, and involved families. That's why we call ourselves "The DSA Family." As a Christian academy dedicated to excellence, Divine Savior’s mission is to provide college-prep academics, a Christian environment, and supportive teachers for its students. We’re passionate about it, and we love working with families and our community. We believe in an education that addresses all a child’s needs: mental, physical, emotional, social, and spiritual. We’ve learned that this is best accomplished when parents, educators, and administrators partner together. You’ll notice that on our campus. We are a community...not just for students, but for parents, relatives, and caregivers, too. We’re in this together, and we care. That’s why we call ourselves the DSA Family. We’re excited to join the Santa Rita Ranch community. For more information about our new campus opening for the 2020-2021 school year, please request an informational packet below. You’ll also receive updates about the campus, as well as invites to our family events, storytimes, and new programs, too. We look forward to meeting you! 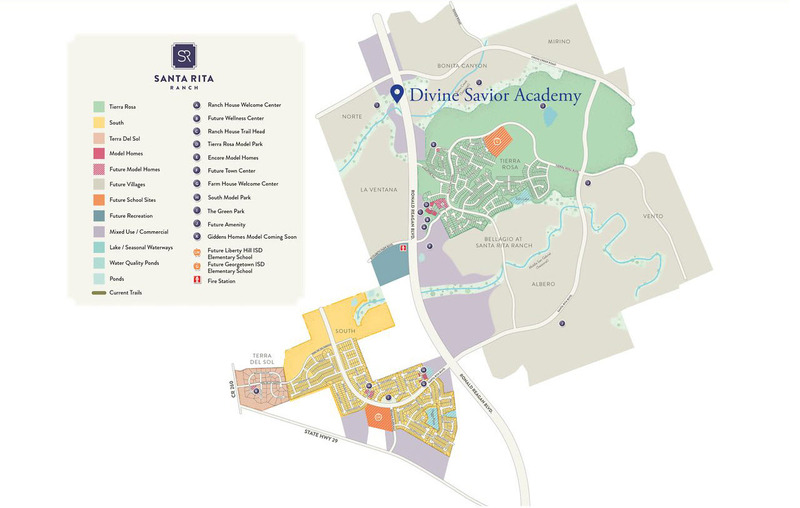 For more information about Divine Savior Academy's Santa Rita Ranch Campus, please click on the button below.